Exercise Balls | Dynamic Physiotherapy & Sports Injury Clinic Inc.
An exercise ball is available in a number of sizes to suit the individual. The primary benefit of exercising with an exercise ball is that instead of exercising on a hard flat surface your body responds to the instability of the ball. This engages more muscles giving a more complete workout. These muscles will get stronger over time. Exercise balls are used mostly to strengthen the core or abdominal muscles, although there are plenty of other uses as well. 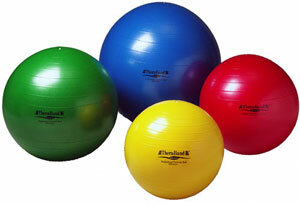 If you have any questions about Exercise Balls contact our staff at Dynamic Physiotherapy.